Gov. Jerry Brown spoke with urgency and used terms like “battle” and “catastrophic risk” when he talked about searching for partners and allies to combat climate change despite the policies of an incoming administration in Washington, D.C.
California Gov. Jerry Brown wants President Barack Obama to permanently ban new offshore oil and gas drilling in the state. In a letter sent Tuesday to the president, Brown said allowing new drilling would be inconsistent with goals of reducing reliance on fossil fuels and combating climate change. A temporary ban in California, Oregon and Washington expires in 2022. “We don’t need to spoil or put at risk the beautiful beaches or waters that are adjacent to our coast,” Brown said. Obama has the authority through the Outer Continental Shelf Lands act to permanently withdraw federal waters from offshore oil and gas drilling, Brown said. Brown says he doesn't know if President-elect Donald Trump would have authority to overturn a permanent ban. Trump has selected Oklahoma Attorney General Scott Pruitt to lead the Environmental Protection Agency. Environmental groups denounced the choice last week. The Sierra Club likened Pruitt's selection as EPA administrator to "putting an arsonist in charge of fighting fires." Pruitt has been a vocal public denier of the science showing that the Earth is warming and that man-made carbon emissions are to blame. 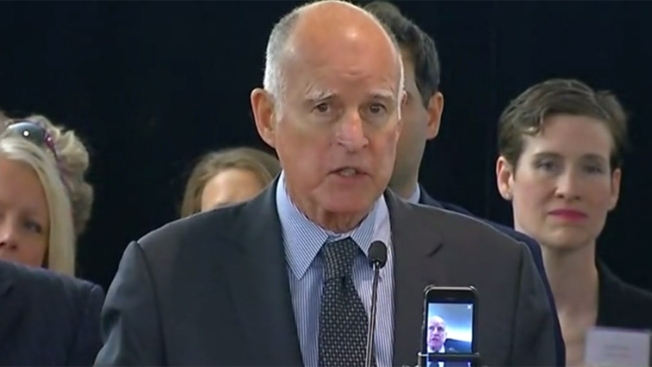 Brown spoke with urgency and used terms like “battle” and “catastrophic risk” when he talked about searching for partners and allies to combat climate change despite the policies of an incoming administration in Washington, D.C. The governor announced his proposal in Coronado, near San Diego, at an event to launch a new organization to protect oceans. Oregon and Washington also joined the International Alliance to Combat Ocean Acidification. The governor plans to ask the governors of those states if they want to join the effort.